Edition Details: 1st h/b Edn. Hardback. The case of Jack the Ripper - the unidentified serial killer who plagued the East End of London in the late 19th century - is one of the greatest and most famous unsolved murder mysteries of all time. 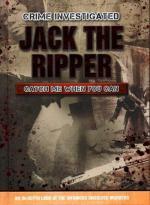 This comprehensive account documents the key event that took place around the time of the brutal Whitechapel killings, speculates over the identity of 'Jack' and details his unfortunate victims. With authentic photographs and well-researched information. Illus. in colour and b/w. With Picture Credits. 224pp. 8vo h/back. A v. scarce h/back edn. of this title. As New. Pictorial covers, dw. not required.